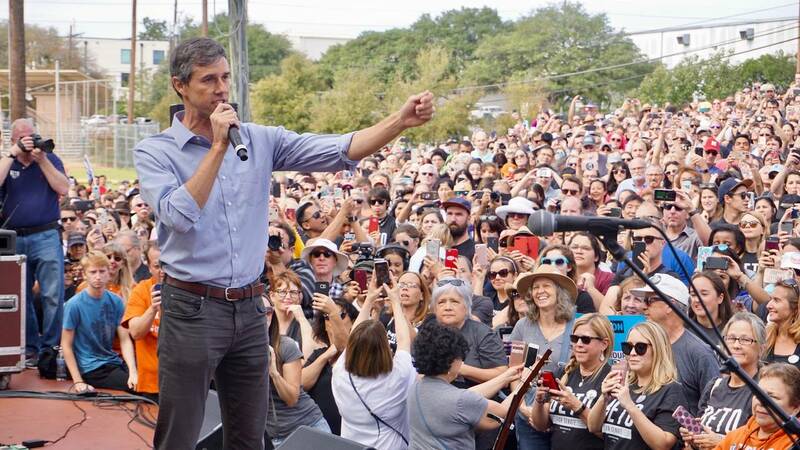 Beto O'Rourke says he supports universal health care, but he wants to take a different path to get there than many of his more progressive rivals for the 2020 Democratic presidential nomination. The former Texas representative is backing a little-known House Democratic proposal called Medicare for America, which calls for expanding government-run health coverage while keeping employer-sponsored insurance plans. For O'Rourke, the proposal's appeal is that he thinks it moves the country to guaranteed health care more quickly than the alternatives, including the signature Medicare for All proposal from Vermont Sen. Bernie Sanders, an independent who is also vying for the Democratic nomination. That's in part because it would maintain the private insurance industry, which is a deal breaker among progressives. "What it says is, if you like your employer-sponsored insurance, you like the network that you're in, you like the doctors that you can see, you're happy with that, you can keep it," O'Rourke said Thursday in Portsmouth, New Hampshire. in response to an audience question. "If you do not like your employer-based insurance and want to enroll in Medicare, you can. If you have no insurance whatsoever or if you are under-insured today, you can enroll in Medicare as well." While many Americans like the idea of expanding Medicare, their support drops when they hear private insurance would be eliminated, according to polling by the Kaiser Family Foundation. Medicare for America would address those concerns, said Jen Tolbert, the foundation's director of state health reform. "The bill does try to strike a middle ground," she said. The Medicare for America legislation was introduced last year by Reps. Rosa DeLauro, a Connecticut Democrat, and Jan Schakowsky, a Democrat from Illinois. But unlike most of the other Medicare for All-type plans, it doesn't have a Senate version that's supported by other candidates. The gradual shift to a government-run program is very similar to a proposal from the Center for American Progress, a moderate left-leaning think tank. It provides the most politically viable path to universal coverage, while respecting those who like their employer coverage, said Topher Spiro, the center's vice president for health policy. "For those who are not satisfied with their employer coverage, it allows them the option to move over to the Medicare plan at their own pace," Spiro said. "Our view is that people will vote with their feet." Retaining private insurance plans, however, is unlikely to win the plan many fans in the health care industry. It's still a stepping stone to a single payer system, which eliminates consumer choice and does little to address costs, said Lauren Crawford Shaver, executive director of the Partnership for America's Health Care Future, a coalition of insurance, pharmaceutical, hospital and doctor groups, which opposes all Medicare for All-type plans. Medicare for America provides comprehensive benefits -- including prescription drugs, dental, vision and long-term care -- to those currently on Medicare, Medicaid and Obamacare plans, as well as to the uninsured. Newborns would automatically be enrolled. Private insurance, however, would continue to be an option. Large employers could keep providing benefits, though they can also help their workers buy Medicare for America coverage. Employees can also choose Medicare for America coverage over their work-based plan. And folks could opt to buy private policies through a Medicare Advantage-type plan or decide to keep their children on their work-based polices. The legislation, however, isn't as generous as the Medicare for All proposals, which essentially provides all care at no cost. Enrollees would have to pay up to 9.7% of their monthly income as premiums, though the poor would pay nothing and subsidies would be available for the middle class. There would also be deductibles and co-pays, with an annual limit of $3,500, or $5,000 for families. To finance the program, the plans calls for undoing the Republican tax bill, imposing a 5% surtax on adjusted gross income above $500,000, and increasing the Medicare payroll tax. Also, there would be levies on investment income above a certain threshold, tobacco products, beer, wine, liquor, and sugar-sweetened drinks. States would also have to contribute an amount equal to what they currently spend on Medicaid.